2017 Scholar Award & Essay Contest is LIVE! The Star-Spangled Banner Flag House in Baltimore Maryland is a National Historic Landmark and the historic home of Mary Pickersgill, the woman who sewed the Star-Spangled Banner. The Star-Spangled Banner is the giant American flag that inspired Francis Scott Key to pen our national anthem when it flew at Ft. McHenry during the War of 1812. This year on Flag Day, Wednesday, June 14th, 2017 the Flag House will award the fifth annual Flag House Scholar Award and a scholarship in the amount of $1,812.00 (generously donated by the National Chapters of the United States Daughters of the War of 1812) to a high school senior to put toward the college of his/her choice. The winner will be chosen by a panel of judges as a result of an essay submission. 1. Essay must be no more than 300 words. 2. 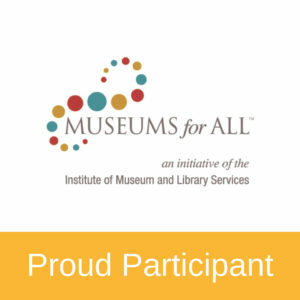 Essay must be submitted through this form- please do not e-mail or mail your essay. 3. Essay must answer the question posed. 4. 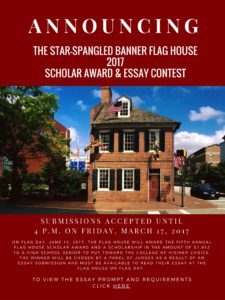 Winner must be a high school senior and able to travel to Baltimore to read his/her essay aloud at the Flag House on June 14, 2017. Submissions will be accepted until 4:00 p.m. Friday, March 17, 2017. ← 2nd Annual Flag House Art Contest!